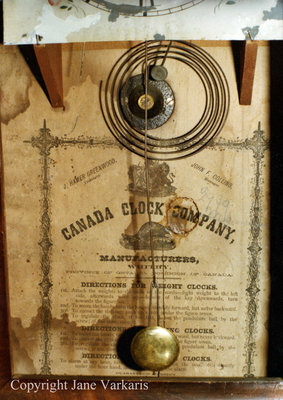 A colour photograph of a label from a clock made at the Canada Clock Company Factory in Whitby, Ontario circa 1872. CANADA CLOCK COMPANY, (logo of a beaver), MANUFACTURERS, WHITBY. PROVINCE OF ONTARIO, DOMINION OF CANADA. 1st. Attach the weights to the ends of the cords -light weight to the left side, afterwards wind up -handle of the key downwards, turn towards the figure six. 2nd. To move the hands, turn the longest steadily forward, but never backward. 3rd. To correct the striking, push up a wire under the figure seven. 4th. To regulate the clock, if too fast, lower the pendulum ball by screw; if too slow, raise it. Canada Clock Factory Label, c.1980s, Jane Varkaris. Whitby Archives A2014_015_003.